Not wanting to bore you but we must advise the following for all persons using our website. 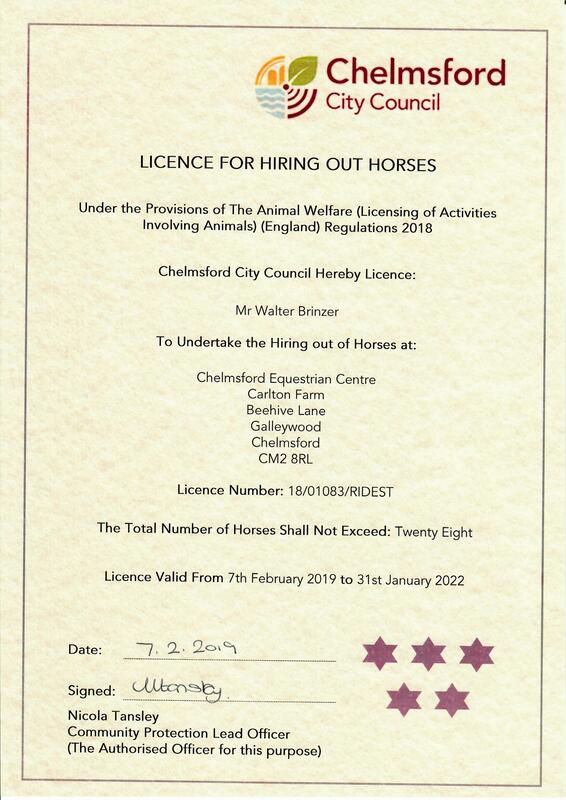 www.chelmsfordequestriancentre.co.uk is a site operated by Chelmsford Equestrian Centre Limited (``We``); we are a company registered in England and Wales under registration number 7841610. Our registered office is 44/54 Orsett Road, Grays, RM17 5ED. Our riding school and livery stables are situated at Chelmsford Equestrian Centre, Carlton Farm, Beehive Lane, Chelmsford CM2 8RL. We are also known as ``Chelmsford Riding School`` and ``Chelmsford Livery`` which are trading names or identities we use and claim for ourselves as trademarks. You can contact us on 01245 358116 to book a riding lesson or to discuss any other issues that may be of interest to you. If you have any concerns about material which appears on our site, please contact info@chelmsfordequestriancentre.co.uk.